ESI offers "hold-up" or "panic" alarms designed to generate immediate response to emergency situations. All retail establishments are subject to hold-ups, armed robbery and forced intrusion. Some businesses are more susceptible than others due to many factors including location, type of business, cash transactions etc. Having an ESI certified silent holdup system or panic alarm available, can provide employees with a safe and effective way to notify authorities in the event of a robbery. Silent alarms have the added value of providing employees with a speedy recovery from the trauma and confusion associated with hold-ups just knowing help is on the way. Silent alarms can also be triggered during the robbery and can provide police with the advantage to thwart the crime immediately after it has occurred. 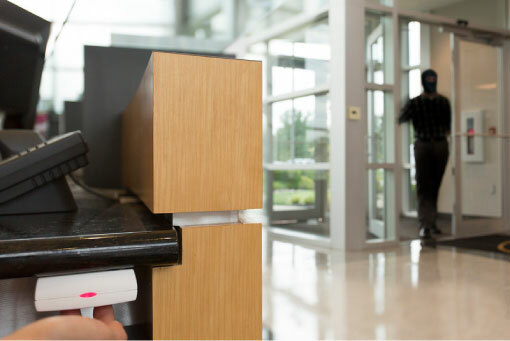 Installing a certified commercial silent hold-up system can help to reduce the business owner’s liability in the event an employee is injured during a hold-up. 24 hour monitoring in our U.L. approved monitoring center. Connection and interface to audio and/or video recording equipment. ESI's unique dual alarm reporting option ensures fast and accurate dispatch of law enforcement. Many silent alarm activation features, including under the counter and wall mounted buttons, foot rail activation, cash drawer money clip, inside cooler and freezer buttons, wireless belt clip, and pendants. ESI offers optional monthly or quarterly system tests and user training.